We are wholly into the middle of summer. These "dog days" have been anything but although I ran the AC last night for an hour to get the humid out of the house. I am not minding the absence of the dripping or broiling summer days. I have not slept this soundly in a month and a half, seriously. That robin what usually wakes me up at 5:00 with the crack of dawn has been nowhere to be found this summer. I hope he bought a new condo in a spiffier development. Hauling it out of bed has been painfully, in a literal and figurative manner, hard when there is a delightful breeze bringing the fresh smell of summer through the window. Even the RA seems to have calmed down although I'm still stiff in the mornings. Wish "they" would figure out why. But something has been missing from this summer. I wasn't exactly sure what it was until last week when I listened to a brief interview with an entomologist from the University of Illinois. She mentioned butterfly populations state-wide have seen as much as a 70% decline in numbers. Seventy percent. That's a lot of butterflies. So I started looking. I don't know what this one is. 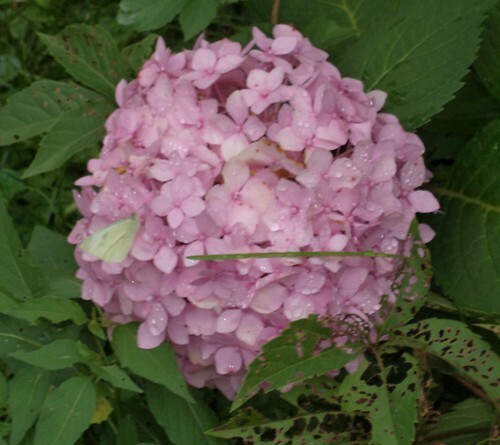 It's on the hydrangea off the deck. I've seen only one or two of these around the deck flowers. But I can't honestly tell you if that's more or less than what I'd usually see. The biggest difference is the absence of monarchs. 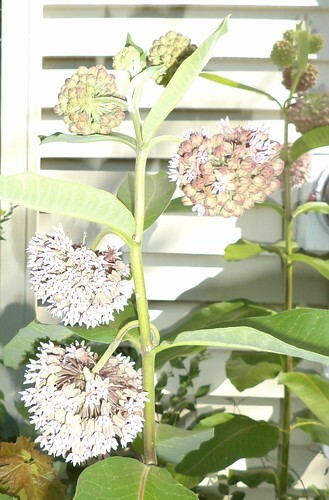 You know how much I love my milkweed plants. The tall plants with their almost plastic looking flowers with the spicy scent are everywhere this year. The seeds must not have scattered very far in the fall. I have a birdbath I keep filled because butterflies need water as well as food. But after I listened to the interview I realized I'd seen exactly one monarch this summer. One. Scientists don't know why there are so few butterflies this year. Some feel last year's prolonged, all-summer drought is to blame. Without the food sources, butterflies died before they could lay the eggs for the next brood, or that brood died due to lack of food or water. For the monarch, habitat destruction in Mexico, where they overwinter, is a big problem for their survival. It is possible, scientists said, for butterflies that have more than one brood per year, to make a comeback in the fall as conditions this year are very favorable to butterfly survival. I've noticed. I thought it was my yard, that perhaps my inattentiveness to yard work, or tidy disorder or "I'll get around to it"style had finally caught up with me. No, it's endemic across the state. There just aren't butterflies. In addition to their grace and beauty, butterflies are pollinators. They are part of the insects and bats that we need to maintain food sources for ourselves. Without them, we won't have flowers and fruit. They aren't as single-mindedly efficient as honey-bees, but they provide supplemental insurance that our crops will be pollinated. Their decline, particularly in so drastic a measure, is cause for alarm. Habitat destruction is probably a number one cause of decline. Our humanity and the climate change we have created is another. To the right, in the blogs I read is Those Northern Skies. On August 4th, Melissa talked about raising monarch butterflies and provided tips for people wanting to do the same. I think that's something I'd like to try. I don't know that I can find a monarch egg anymore this season but now that I know what to look for, I will head out to my milkweeds next year and see what I can find. I've wanted to have a yard that helped nurture nature. It hasn't worked out completely as I would have liked it, but I'm okay with that. Maybe next year I can work on another section and provide critical survival to one of the most recognized and most endangered butterflies we know.